Kobe Bryant took a lot of shots in his career - 30,699 to be precise (regular season and playoffs combined), second-most in NBA history and nearly 2,000 more than Michael Jordan did in his legendary career. Data for each of these shots is publicly available from NBA.com, but analyzing all thirty thousand shots to find insights and trends from Kobe Bryant’s legendary career is an arduous process even for the most ardent fan! Using DataRobot, we instantly loaded this data and explored every shot he ever took. We looked at where he shot from, when the shot was taken, against who and ultimately, how likely that shot was to go in. Although Bryant is now retired, precise exploratory data analysis can help teams and athletes uncover insights to improve future performance. Knowing what to look for and what constitutes actionable insight is half the battle. Having a machine learning automation tool to crunch data and build predictive models makes the other half much more efficient and accurate. 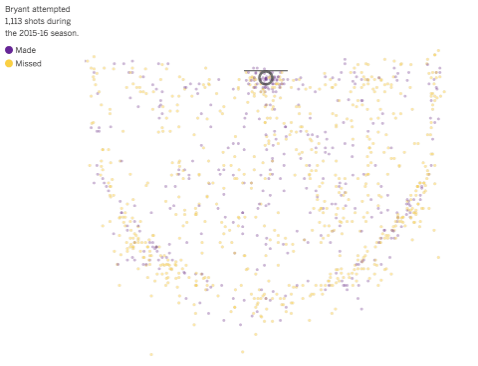 Here are 4 insights uncovered in just 4 minutes using DataRobot to study Kobe Bryant’s shots. Insight 1: How do off-court issues affect on-court performance? Teams are perpetually trying to find the link between an athlete’s off-court behavior and their on-court performance. Off-court habits - such as sleep and diet - are quantified in order to find direct correlations that improve player performance. But what about more nebulous or intangible off-court issues, like social distractions or emotional withdrawal? Between 2003 and 2004, Bryant was involved in a legal issue that ultimately ended in dismissed charges and an undisclosed settlement between Kobe and his accuser. He played through this legal issue, but how did this impact his performance? How did he play compared to other points during his career? According to the data, he played very poorly. His average likelihood of making a shot during this period - 42% - was the lowest of his career, except toward the end of his career when he sustained injuries. The data clearly shows the extent to which off-court issues affected on-court play. His season ended with the Lakers losing in the NBA Finals and Bryant shooting only 35% from the field in that series. His off-court issues carried into the following season, as a former coach released a tell-all book that painted Bryant in a poor light, and the intense media scrutiny did not ease up. On the court, he played with a supporting cast that was worse than he ever had previously, and his average shot had only a 43% likelihood of going in, well below his typically lofty standards of around 45%. It wasn’t until the 2005-06 season when Bryant returned to the height of his powers. During that year, he had a 46% likelihood of making an average shot and turned in some legendary performances -- scoring 62 points in just three quarters against the Dallas Mavericks (who only managed 61 points as a team in that same period) and dropping 81 on the Toronto Raptors, the second-highest single-game scoring total in NBA history. Insight 2: Who did Kobe like playing against? There’s a definite answer to this question: Kobe LOVED playing against the New York Knicks. Unsurprisingly, the Knicks were also consistently one of the dregs of the league during Kobe’s two decades in the NBA, so it stands to reason that Kobe would enjoy getting his shots off against their soft defense. Throw in the mystique of the Knicks’ home court at Madison Square Garden - the World’s Most Famous Arena - and it’s no surprise that Kobe’s average shot had a 48% likelihood of going in against them. For a nice cherry on top of the data, Kobe once scored 61 points (on a very efficient 31 shots) in a 2009 matchup at Madison Square Garden, a scoring total which was the single-game record for that arena at that time. The data also shows that Kobe attempted more shots against the San Antonio Spurs, Phoenix Suns and Sacramento Kings than any other team. No surprises there: Kobe had years of heated playoff battles against all three teams. Unsurprisingly, Kobe also had above average shooting likelihoods against the Suns and the Kings, and also holds impressive career records against them - 50-36 lifetime vs. the Suns, 53-27 lifetime vs. the Kings. Against the Spurs, however, Kobe was far below his normal shooting average and, as a result, only amassed a 43-48 career record against them. As a Boston company (full of Celtics fans!) we’d be remiss in not mentioning how Bryant shot against the team in green. Surprisingly, despite his penchant for playing well in the biggest moments, Bryant faltered against his Lakers’ most bitter rivals; the Celtics held him to the third-worst shooting performance of all the opponents Bryant faced throughout his career. Did the history of the sport’s most classic rivalry weigh on him every time he faced the Celtics? Insight 3: Where did Bryant like to pull-up from? All NBA players have their sweet spots, the area of the court where they are most comfortable shooting and scoring. As a defender, knowing a player’s sweet spot - and more importantly, how to move them from that area - is the culmination of scouting, watching game film, and studying the data. What does the data say about Bryant’s sweet spot? As the heavy splotches of red (indicating made shots) on the right side of the court suggest, Bryant was a little bit more efficient pulling up from the right side of the court than from the left. Intuitively, this makes sense; Bryant was a right-handed player, and would therefore be more comfortable dribbling right and then shooting. While it might not look like a huge difference, even a single percentage point in shot likelihood can make a massive impact. Winning basketball games often comes down to a single possession or point. As a defender you have to trust the data, trust the process, try to force him to his left hand and to the left side of the court and live with the results, make or miss. Incidentally, the aforementioned greatest player to ever step foot on the court, Michael Jordan, is still studying data and game film even in retirement. In talking about how he would defend LeBron James - the heir to both Jordan and Kobe as the next great legend - Jordan would also force LeBron to his left, which most often yields a lower-percentage jump shot. Similar to Kobe Bryant. Insight 4: What was Kobe’s relationship with the three-point shot? Steph Curry, widely considered the greatest shooter of all time, has taken 45% of all his career shots from behind the three-point arc. LeBron James, not a great shooter but universally thought of as one of the 3 to 5 best players ever, has taken 20% of all his career shots from distance (all data from basketballreference.com). Was this evolution prompted by a league-wide shift to shooting more threes overall? Did Kobe gain an appreciation for advanced analytics that suggest the league-wide Expected Value (EV) of an average three-pointer (1.05 points per average attempt) was much more efficient than the EV of an average mid-range shot (0.788 points per average attempt)? Or maybe Kobe was just getting old and tired of attacking the rim constantly, choosing to settle for more open looks from a great distance while enjoying a year-long farewell tour on a team that wasn’t playing for any real stakes. After all, having taken more than 30,000 shots over his 20-year career - and giving us a multitude of data points in all sorts of contexts to explore his illustrious achievements - he deserves the break.